Special Containment Procedures: All known articles of footwear affected by SCP-1667 are to be stored in Containment Locker 16 at Storage Site-23. Due to the contagious nature of SCP-1667's effects, no shoes, boots, sandals, flip-flops, slippers, flippers, foot-wraps, galoshes, moccasins or clogs are permitted to enter a 2 meter radius surrounding Containment Locker 16 without the prior approval of Researcher Davis. Socks are permitted. On a fortnightly basis, one member of personnel with Level 1 security clearance must carefully open Containment Locker 16 and reposition all footwear inside to its most north-westerly positions. In the event of a containment breach caused by pressure-related internal damage to SCP-1667's container, all footwear affected by SCP-1667 is to be re-contained and Containment Locker 16 reinforced. Note: It is suspected that SCP-1667 may not be fully contained. In the event of a suspected instance of containment breach, a barefoot Mobile Task Force must be sent to investigate. Description: SCP-1667 is a contagion that spreads between almost any type of footwear. Any organism wearing or in physical contact with an item of footwear affected by SCP-1667 is compelled to reach an unknown location deep below the central Pacific Ocean, regardless of personal danger. Almost all items of footwear, the main exception being socks, are susceptible to contagion of SCP-1667. Organisms affected by SCP-1667 will attempt to remain in physical contact with affected footwear. Humans under the effects of SCP-1667 are able to communicate semi-rationally but are primarily driven by their goal to enter the Pacific Ocean and may become physically violent in order to achieve it. Class D personnel under the effects of SCP-1667 were able to use basic navigation skills to avoid obstacles in their path yet always selected travelling on foot over the use of any type of vehicle. Footwear affected by SCP-1667 has been noticed over time by staff slowly moving south-west in a linear pattern, at a rate of approximately 12.7cm per week. It is speculated that the effects of SCP-1667 have caused many humans and possibly other land animals to drown with the appearance of suicidal intent. 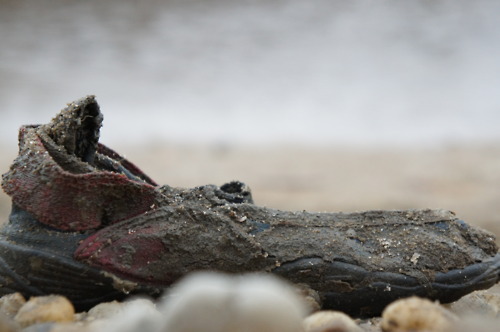 The first object discovered to be affected by SCP-1667 was a brown and red leather hiking boot (hereafter referred to as SCP-1667-1) recovered from █████ Beach, ████████, New Zealand in 19██. The small town came to the Foundation's attention after seventeen people were reported missing in the area within two months. Upon investigation it was discovered that several of the missing persons had been seen near █████ Beach on the days of their disappearances. Mobile Task Force ██-█ was sent to conduct a thorough search of the beach, which led to the discovery of SCP-1667-1 and the effects of SCP-1667. The contagious nature of SCP-1667 was discovered when other articles of footwear brought into SCP-1667-1's area of effect began to produce the same effects after a short exposure time. ████ members of Mobile Task Force ██-█ did not remove their boots during the recovery of SCP-1667-1 from █████ Beach and in the resulting chaos, [DATA EXPUNGED]. The following test log has been classified and any personnel requesting this data must have the approval of one member of personnel with Level 2 security clearance. Objective: To observe the range of SCP-1667's effects. Results: Effects of SCP-1667 manifested in black business shoe (and D-8267) after approximately 8.41 seconds of exposure from 1.4 meters distance. Black business shoe reclassified as SCP-1667-11. Objective: To observe a human under the effects of SCP-1667. Results: Subject held SCP-1667-11 against her chest and began running towards the door. When subject's path was blocked by Researcher Davis, subject stated "Move". When Researcher Davis did not comply, subject kicked him in the groin and sprinted from the room. Subject attempted to leave facility and was terminated. SCP-1667-11 was partially damaged and has been discontinued from further testing. Objective: To determine whether SCP-1667 affects animals other than humans. Results: Effects of SCP-1667 manifested in subject after approximately 5.23 seconds of physical contact with SCP-1667-2. SCP-1667-2 detached from subject. Objective: To determine whether SCP-1667 affects organisms other than animals. Results: Effects of SCP-1667 noticeably manifested in subject after two weeks of physical contact with SCP-1667-2. Subject grew approximately 23 centimetres south-west, differing from its natural eastward growth direction. SCP-1667-2 detached from subject. Objective: To discover the location to which SCP-1667 leads its victims. Results: Effects of SCP-1667 manifested in subject after approximately 54.3 seconds of physical contact with SCP-1667-2. Subject was transported from facility, released from ████████ Beach and tracked south-west for approximately 3500 kilometres before signal was lost. Subject was noted to have begun increasing in speed exponentially after it reached coordinates ██°S ███°W. Video footage revealed nothing of interest. SCP-1667-2 presumed unrecoverable. Objective: To spread SCP-1667's effects to a pair of flippers. Results: Effects of SCP-1667 manifested in navy blue flippers (and D-8268) after approximately 10.13 seconds of exposure from 1.2 meters distance. Left and right navy blue flippers reclassified as SCP-1667-12 and SCP-1667-13 respectively. Results: Subject was given an Atmospheric Diving Suit (ADS) with waterproof video camera and audio communicator attached and was instructed to put on SCP-1667-12 and SCP-1667-13. Subject was then released from ████████ Beach and tracked to coordinates ██°S ███°W. Once D-8268 reached this location, video feed was lost due to equipment failure and subject began noticeably increasing in speed. Analysis of background noise in the audio feed and the muttered commentary of subject D-8268 indicated movement of an underwater entity at least ███ meters in length before [DATA EXPUNGED] resulting in the loss of audio feed and GPS tracking. Notably, 3 minutes and 17 seconds before signal was lost, D-8268 claimed to observe [REDACTED] and ADS oxygen levels began decreasing at a significantly faster rate. Investigation is ongoing. SCP-1667-12 and SCP-1667-13 presumed unrecoverable. Audio File: The final minute recovered from SCP-1667 Audio Feed. Further testing of SCP-1667 has been discontinued in order to prevent additional possible containment breaches.